Marvel just launched a super retro website for the Captain Marvel movie. 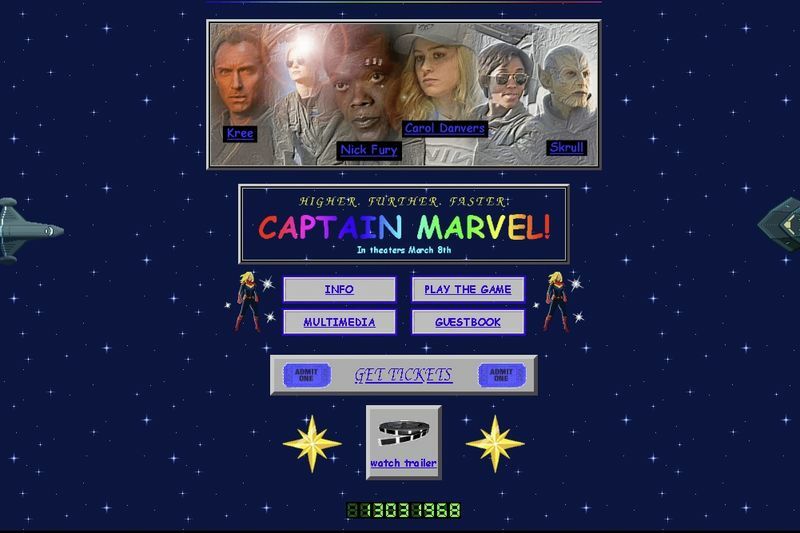 The Captain Marvel website, features some weird animations and rainbow fonts, which is a major throwback to the '90s decade's wacky web design. Fans can find information about the movie's characters, where to buy tickets, and play a nostalgic Captain Marvel computer game. The movie, which stars Brie Larson as Carol Danvers/Captain Marvel, will hit theatres on March 8, 2019. According to the website's info page, Captain Marvel is set in the '90s, hence the '90s design. The movie highlights Danvers, who is a badass superhero and aims to save the world from intergalactic warfare. If fans want to see character photos, they can click the vintage "forward" and "backward" buttons to access an image gallery. Even though the website has some modern updates, it's a nostalgic throwback to a time where HTML and other Internet programming efforts were in their baby stages. The Captain Marvel website is a fun, nostalgic tease for the upcoming film.